At lunch time Mickey went with a guy from church to do some "ninja" training. The guy had trained and tried out for American Ninja Warrior. He told Mickey about the training and, of course, he wanted to try it. They met at a fitness park downtown. There they flipped over bars, did pull ups, swung on some monkey bars, jumped up and down stairs three at a time, and other foolish things. They are guys after all. The second time through the course Mickey noticed a problem with his hand. 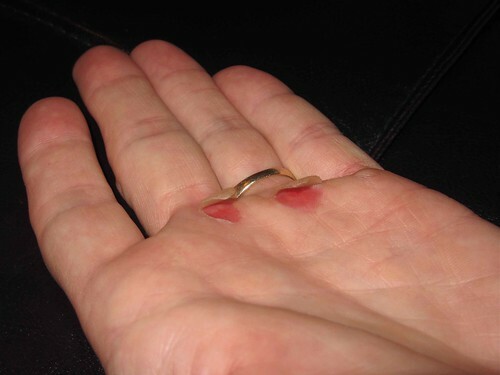 He not only had blisters but skin torn away from his hand. Isn't it lovely? I'm itching to cut it off but he thinks it will reattach. I don't see that happening. And of course, Kelly was right. After what looked like a remarkable healing process, I finally had to cut away the loose skin. The girls were pretty grossed out about it, but Kade had fun moving the flaps of skin. I know...gross boys!